In order to prevent the transfer of harmful organisms, ships’ ballast water is often subjected to electrochemical disinfection. * “However, our analyses show that electrochemical disinfection creates numerous so-called disinfection by-products (DBPs),” explains Prof. Philippe Schmitt-Kopplin, who led the study. He and his team at the Analytical BioGeoChemistry (BGC) research unit at the Helmholtz Zentrum München, working in close collaboration with colleagues in the US, compared samples of treated and untreated ballast water. Using high-resolution mass spectrometry, they discovered that treatment led to the formation of 450 new, diverse compounds, some of which had not previously been described as disinfection products or been structurally categorized. “Until the toxicological features of these compounds are fully clarified, we recommend a cautious approach to disinfecting ballast water,” Schmitt-Kopplin notes. According to the scientists, the study – the first in-depth analysis of DBPs in ballast water – first and foremost revealed the high degree of complexity of the resulting products. As an alternative, Philippe Schmitt-Kopplin recommends the use of physical processes such as filtration or adsorption**. In addition, the Helmholtz researchers point out the broader significance of their findings: as a result of the increasing dissemination of goods around the world, a growing number of ever-larger ships are being used. These vessels take on correspondingly large and increasing amounts of ballast water in order to stabilize their position in the water and to balance out any changes in the weight of goods or fuel during the journey. 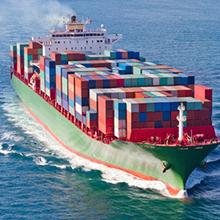 Experts worldwide are now discussing ways of dealing with this water, as discharging untreated ballast water will be prohibited in the future. The alternative method of choice at present is electrochemical disinfection. “Large volumes of disinfected ballast water are distributed daily in coastal waters, but as yet their impact on the environment cannot be foreseen,” says first author Michael Gonsior of the University of Maryland’s Center for Environmental Science. “In future studies, we want to find out what influence the DPSs have on coastal ecosystems.” Now the researchers hope that their data will help to shift the focus more towards alternative methods. *During electrochemical disinfection, electricity is used to generate chemically active components directly by means of electrolysis, i.e. by passing an electric current through it. As German Research Center for Environmental Health, Helmholtz Zentrum Münchenpursues the goal of developing personalized medical approaches for the prevention and therapy of major common diseases such as diabetes mellitus and lung diseases. To achieve this, it investigates the interaction of genetics, environmental factors and lifestyle. The Helmholtz Zentrum München has about 2,300 staff members and is headquartered in Neuherberg in the north of Munich. Helmholtz Zentrum München is a member of the Helmholtz Association, a community of 18 scientific-technical and medical-biological research centers with a total of about 37,000 staff members. The independent Analytical BioGeoChemistry Research Unit (BGC) investigates molecular interactions among substances in biogeosystems. Together with separation procedures and mathematical methods, high-resolution methods of organic structural characterization allow a precise space and time-resolved analysis. The goal is to achieve a better understanding of molecular processes in ecosystems and to improve the identification of biomarkers in organisms. The BGC is a part of the Department of Environmental Sciences.